D-Y outgained Nauset 449-176, including a 360-66 advantage in the first half. 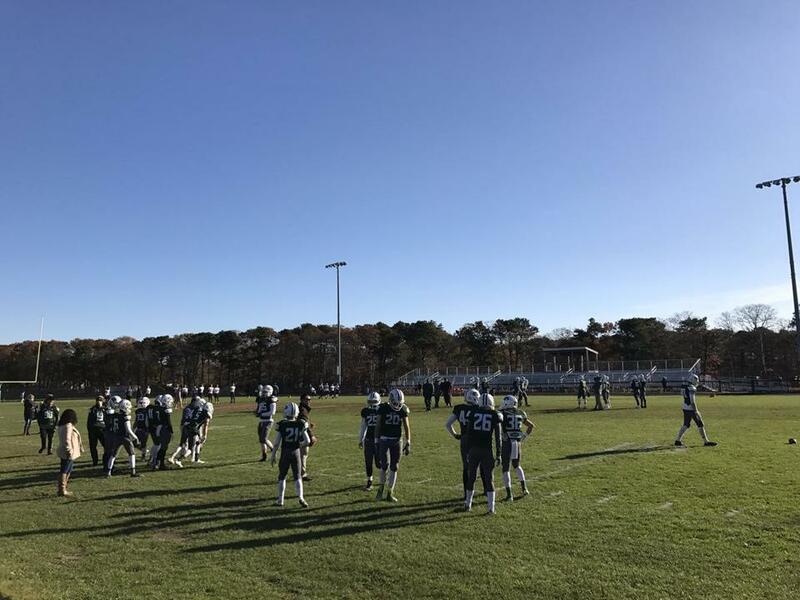 SOUTH YARMOUTH — As Dennis-Yarmouth hoisted a trophy for its 15th straight Thanksgiving Day win over Nauset High, the cry from one player — “I want the big one, though!” — was impossible to ignore. The Dolphins’ starters played one full half before giving way to the reserves, with no injuries to report, in a 34-8 rout of their Outer Cape rivals. And with it, the attention now turns squarely to next Saturday’s Division 5 Super Bowl at Gillette Stadium, where D-Y will face Western Mass. champion West Springfield (11-1) and its celebrated tailback Vaunell Hill in what should be one of the day’s best games. “They [West Springfield ] are good, everyone’s good at this point,” said D-Y coach Fred Funk. Globe pictures from the day’s action. And as for Hill? Funk didn’t want to give anything away when asked if he’s got an idea yet of how he wants to scheme for the shifty star. “Yeah, we’d better tackle,” he said with a laugh. For the record, West Sprinfield sat out its 1,907-yard, 25-touchdown back in a 34-0 win over longtime rival Agawam on Thursday morning. 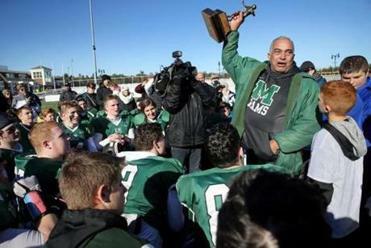 Coach Chad Labonte told masslive.com that his junior tailback/linebacker had taken a lot of hits this season and the decision was made to hold him out. As for D-Y’s win, quarterback Jacob McCarthy (5 of 8 passing, 106 yards, TD) and tailback Bobby Evans (5 carries, 57 yards, TD) made the most of their abbreviated workloads, pushing the sixth-ranked Dolphins (12-0) out to a 21-0 lead less than nine minutes into the contest. Just 42 seconds in, McCarthy started the game with a screen pass in the flat that receiver Daryan Thompson took 50 yards to the house for a 7-0 advantage. That was followed up by touchdown runs from Evans and Jonah Arsenault for the three-score lead with 2:21 left in the opening frame. McCarthy gave way to Payton Doyle under center after the third scoring drive, and the junior quarterback threw two touchdown passes for a 34-0 halftime lead. Nauset (3-8) nixed the shutout with 3:37 to go on a 75-yard touchdown scamper from Dyllon McNeill (14 carries, 117 yards, TD). D-Y outgained Nauset, 449-176, including a 360-66 advantage in the first half.